This is the third spraying of toxic pesticides in Staten Island this summer. Parts of Queens were sprayed with pesticides on August 14th; the third spraying there as well. The Bronx has been sprayed twice this season and Brooklyn once last week. According to the New York City Department of Health, this will be the “seventh adulticiding” with pesticides, either Duet or Anvil 10+10, this summer. Adulticides kill adult mosquitoes but are also harmful to other insects, including dragonflies and bees, as well as bats, birds, other animals and wildlife, and humans. The City of New York says that “West Nile virus has been detected in mosquitoes in all five boroughs.” The “detection” is done via mosquito pools placed around the city and then checked. Still, this does not indicate a need to mass spray a population with harmful and cancerous chemicals. 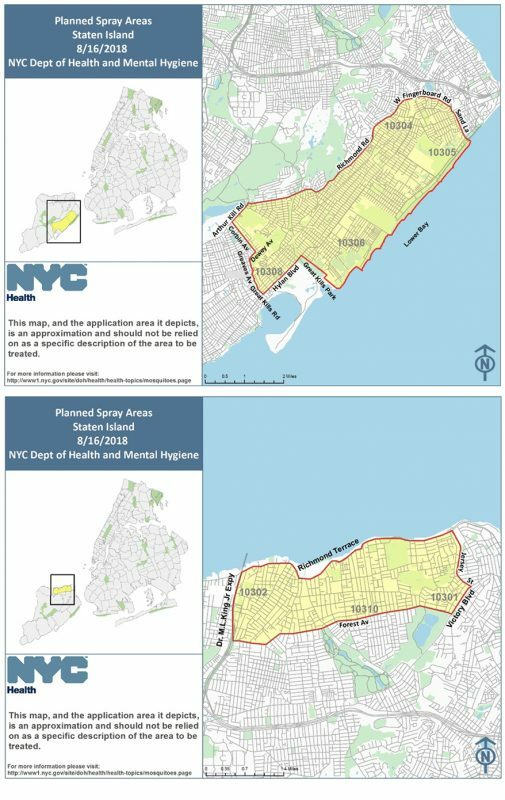 The Queens and Staten Island spraying were announced on Friday, August 10 so at least there is now more advance notice (which No Spray Coalition advocated for strongly) but due to little media coverage, it is likely many are still unaware. marshes and wetland areas of the Bronx, Brooklyn, Queens and Staten Island on Thursday, August 16, Friday, August 17, and Monday, August 20, between the hours of 6 a.m. and 7 p.m., weather permitting. The helicopter will treat only non residential areas. .. In case of bad weather, application will be delayed until Tuesday, August 21, Wednesday, August 22, and Thursday, August 23 during the same hours. For the aerial application in marshes and wetland areas of the Bronx, Brooklyn, Queens and Staten Island, the Health Department will be using environmentally friendly larvicides to kill immature mosquitoes before they grow into adults. During warm weather, mosquitoes can breed in any still water standing for more than five days. The pesticide spray schedule for New York City dubbed “Mosquito Control Events” can be found here.